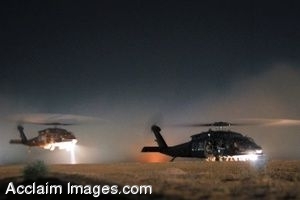 Description: Clip art photograph of U.S. and Iraqi special operations forces take off in helicopters from Balad Air Base, Iraq, to conduct operations in Amarah, Iraq. The goal of the ongoing operations is to disrupt weapons smuggling and decrease insurgent influence. (DoD photo by Mass Communication Specialist 2nd Class Miguel A. Contreras, U.S. Navy) Clipart photograph by Department of Defense Public Domain.